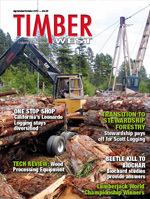 Tony Leonardo knows that to stay in logging, diversification is key. 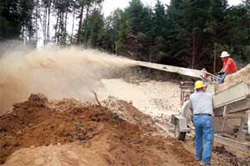 To keep his crew working year round, he has added road building and trucking to the company’s portfolio. Today, 40 percent of Leonardo’s income is from logging, 40 percent is from road building, and the remaining 20 percent comes from the trucking side. Born and raised on a dairy farm, Tony Leonardo was used to hard work. Being the oldest, he was up at dawn helping his father feed calves and milk cows. But the dairy life wasn’t for him. After graduating from high school in 1972, he struck out on his own in search of his dream. That year, Leonardo went into the woods, and he’s been there ever since. After a couple decades in the woods, he thought it was time to stop working for others and start his own business. While Friday the thirteenth may be considered bad luck by many, not so for Leonardo. 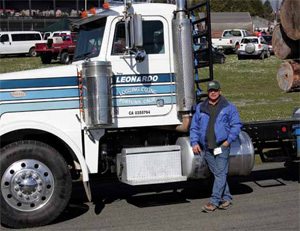 On Friday, August 13, 1993, Tony and his wife, Janice, started Leonardo Logging and Construction Inc.
“It’s a day I’ll never forget,” Leonardo says. That Friday, he purchased the logging outfit from a local company that was going under. It was the foot in the door he needed to get started. With no bank willing to finance the operation, Leonardo took out a $30,000 home equity loan against his house. A few weeks later, he took over payments on some of the previous owner’s equipment. “Eventually I ended up buying a 255 Thunderbird yarder, and I took the $30,000 and bought an old rotary head, some pickups, and an old D-8 Cat, and that’s how I got started,” he says. It turns out it was a wise and lucrative decision. A few years later, Leonardo got rid of the old equipment (other than the 255 Thunderbird yarder) and bought another Cat loader. “I bought another yarder and started another yarder side,” Leonardo says. Those purchases were followed by another Cat in the next four years, and he just kept on growing. 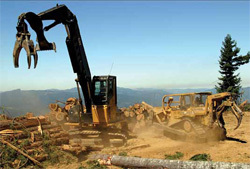 Currently, Leonardo works for two lumber companies, Green Diamond Resource Company and Humboldt Redwood Company. Between the two companies they own the majority of timberland in Humboldt County — approximately to 700,000 acres. “We really don’t run out of Humboldt County for work,” Leonardo says. Leonardo quickly discovered that, if he was going to stay in logging, diversification was the name of the game. To keep his crew working year round, he has added road building and trucking to the company’s portfolio. Today, 40 percent of Leonardo’s income is from logging, 40 percent is from road building, and 20 percent is from the trucking side. When the opportunity to do road work arose in 1999, Leonardo made the leap of faith and got in on the ground floor. “I bought an old Linkbelt 2800 (a used one), and I started out doing some road work,” Leonardo says. Later he purchased a second Cat dozer (D7G), and he began doing rehab work on creeks and upgrading roads and culverts. Doing different kinds of work means having a lot of productive equipment on hand. Out of his six excavators, there are three Cat 325s and a Cat 322, 318, and 305. There are also five Cat log loaders, two 322Cs and a 325, 324D, and 320D. Tony Leonardo has made sure that his company can do just about anything — and do it well. Because of his “can do it all” crew, Leonardo Logging has stayed busy during the these tough years. Also on the job are five Cat skidders; four are 527 track skidders, and the fifth one is 525 rubber tire. “We have two D6Rs (dozers) with grapples, and we have a D5G (dozer) with grapples and a D5G with a winch,” Leonardo says. “Cat has treated me good. They’ve always been there when I needed them,” Leonardo said, plus Caterpillar is the only local company that services big equipment. Not everything Leonardo has tried has been successful. Seven years ago, he started a mechanical side using a feller buncher, but that didn’t work out. He sold the feller buncher and turned all the cutting over to a contractor. Leonardo doesn’t fight fires any longer or do state contracts. “It’s our busy time of the season when the fires are going on. If we pull equipment off of what we’re supposed to be doing, we just lose time,” he says. But, he adds, they do remove timber after a fire on private ground. While many in the industry were struggling in 2010, Leonardo was having a good year. “We stayed busy, and I think the reason we did is because we’re diversified, and we can do anything,” he says. The challenge now is the rising fuel costs that continue to impact the company. “One of our big expenses is fuel, especially with all the trucks on the highway every day and all the equipment. When we’re going full bore in the summer time, we’re burning probably 6,000 to 7,000 gallons of diesel a week,” he says, adding fuel prices on the California coast are probably the highest in the nation. Despite the challenges, it’s Leonardo’s “diversification” philosophy that has paid off for the company.